Young heroine Sayesha Saigal, who is just 21 years old, has taken a surprising decision for her age. 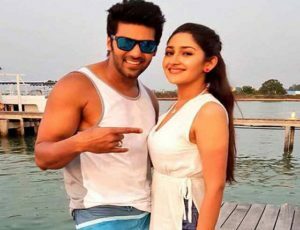 She wants to get married to Tamil hero Arya and settle down in life it looks like. And in that process, she is actually losing some big films, they say. Actually, this ‘Akhil’ fame beauty was supposed to be the lead girl in Gopichand’s upcoming film that is being carved by Tamil director Thiru. However, once she took a call regarding marriage, the beautiful girl doesn’t want to be part of this movie and stunned producer Anil Sunkara by returning his advance. After scouting through a couple of options, finally, Gopichand and his makers have deiced to rope in Tamanna for the role. Though Sayyesha won’t bring the grandeur Tamanna will bring to a film, the film would have been a huge plus for her career as she got no chances in Telugu after the flop show of Akhil. For the now, Sayyesha and her mother Shaheen Ahmed remained silent on the marriage news though they are quite active on social media.